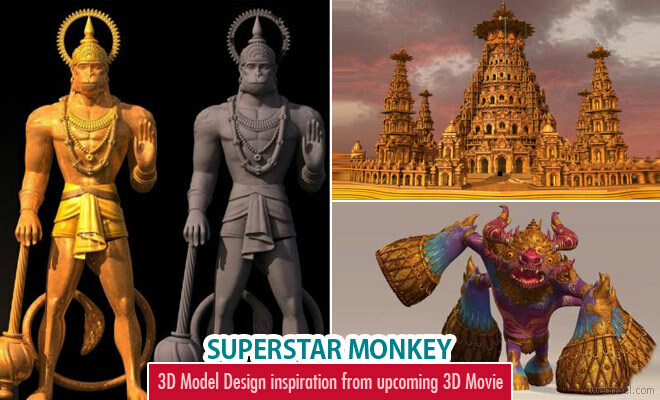 Bollywood Superstar monkey is an inspiration from the great Indian epic - The Ramayana. In this 3d animation, the story revolves around two monkeys and their view of the mythical demon king who ruled the Lanka. The movie is directed by Kevin Lima who has directed other movies like 102 Dalmations, Enchanted, Tarzan and many more. Music composing was done by Music director A.R.Rahman. It's produced by Dreamworks Animations and distribution rights granted to 20th century Fox. The exact date of release is not yet released. Story revolves around two monkey brothers Raj and Deepu. Raj accidentally awakens Ravan, who is a ten headed demon king and he happens to kidnap the bollywood superstar Chandani. The brothers team up together with Chandani's pet monkey Pinki in a bid to save the lady in distress. Ravinder Kundi is a visual development artist, who helped create the 17 characters in the movie. These characters are musical demons based on concept sketches created by Kei Acedera. The 3d characters were then created in Maya and photoshop. Each of the musical demons make different sounds which was inspired by the various musical notes in the soundtrack of the movie, which was created by A R Rahman.